We stock and display over 40 sleep sets from famous makers. Like all products we sell, each is backed by our Unbeatable 30-Day Low Price Guarantee. Did you know that the average person spends 1/3 of their life sleeping? A new bed is a big decision and we want you to be completely satisfied with your purchase. To insure that, we offer our 60-night Comfort Guarantee. Within that time, if you should experience any comfort problem at all with your new bed, just let us know. Remember, it takes your body about 14 days to adapt to sleeping on your new bed. We know it's a big decision, so go ahead, sleep on it! * Don't rely on product labels to tell you which mattress will give you the right support. * Try mattresses out for at least 15 minutes. Don't be embarrassed about lying down on the mattresses on display. In fact, wear loose-fitting clothing when you shop for this precise purpose. * One manufacturer's 'firm' may feel harder than another's "extra-firm". The only way to find out if the support is right is to lie down and give it a try! * Absorbent, breathable & waterproof. * Cool & comfortable to sleep on. * Dust mite barrier & allergen protection. A good night's rest is essential to a good day, so a mattress is one of the most important purchases you make for your home. Believe it or not, out of the next 10 years, 3 of them will be spent in your bed! When comparing, remember that a "bargain" mattress and foundation are no bargain when it comes to getting a good night's sleep. Considering that you'll probably be using your bed more than any other product you own - including your car, TV, computer or cellular phone, the mattress you sleep on is one of the best cost-per-day values on the market. Invest in the best bed you can afford! No single mattress is right for everyone. This is why there are so many different types and thicknesses of padding on top. The padding is what creates the comfort level and feel of the mattress. Gone are the days when a mattress had to be stiff-as-a-board to be good for you. It's interesting to note that recent studies suggest that a medium-firm mattress is more likely to improve back pain than a firm mattress. You'll sleep best when your bed helps you feel cradled in comfort. Today's top-quality mattress sets are designed with luxurious new cushioning materials and extra-soft surface treatments to create more of a plush, comfortable feel. Additionally, it is normal for some comfort impressions to appear in the first few weeks of sleeping on such a mattress. Cramped quarters can turn sleeping into a nightly wrestling match. A healthy sleeper moves anywhere from 40-60 times a night, including a dozen full body turns. You need freedom of motion while you sleep and to help you relax while you're falling asleep. If you sleep with a partner, be sure to select a queen or king size bed. Both are not only wider, but several inches longer than the standard "double", or full-size, which offers each sleeper only as much space as a baby in a crib. It is very important to have the proper frame support. On queen and king size sets, you must have a heavy-duty frame with center support. 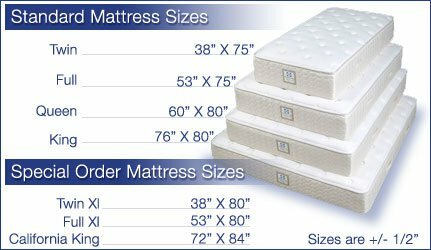 Inadequate support can shorten the lifespan of a mattress set and the quality of sleep it provides. It may also void a manufacturer warranty. A good foundation is as important as a good mattress. The foundation takes a lot of the nightly wear and tear and contributes to the bed's overall comfort and support. Never put a new mattress on an old foundation. In fact, buying the mattress without its matching foundation may affect the terms of the warranty and could also compromise its level of fire resistance. Don't look to the warranty to tell you how long to keep your mattress and foundation. The warranty is there to protect you from product defects, not against the gradual loss of comfort and support. Keep in mind that while a sleep set may still be usable after many years, it's probably not giving you the good night's sleep you deserve. As your child grows, sleep becomes even more important. According to the National Sleep Foundation, 60% of children aged 4-12 years old complain of feeling tired during the day. 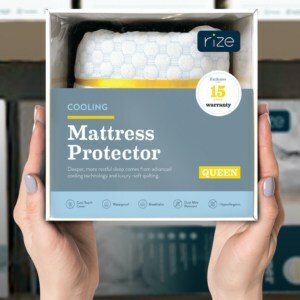 Make sure your kids are sleeping on a mattress that is comfortable and supportive enough for them to fall asleep, stay asleep and wake up feeling refreshed! * Unbeatable 30-Day Low Price Guarantee - We will not be UNDERSOLD. * 60-Night Comfort Guarantee - Try out your bed for 60 nights. If not satisfied, come in for an exchange. You may exchange up or down in price, not just equal or greater value! * NEXT DAY delivery on any bed set $599 & over. * Expert Mattress Consultants - Factory trained sales associates committed to helping you find the perfect night's rest. * Huge Selection - We carry a huge assortment of over 40 sets of bedding from the finest manufacturers. Your new mattress is in our store somewhere and we will help you find it! * Friendly and Honest Service - We have been in business locally for over 50 years. * Great Financing - 6 months same-as-cash, no payments, no interest. * Adjustable Headquarters - We carry the largest line of adjustable beds around. 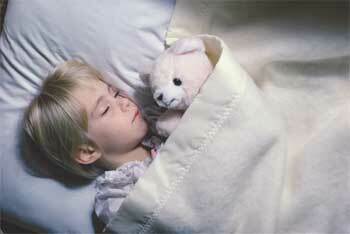 Information used on this web site is available from The National Sleep Foundation and The Better Sleep Council.